In 1906, the Manchu emperor extended the policy of sinofication from Inner Mongolia to Outer Mongolia. By encouraging Chinese men to settle in Mongolian territory and marry Mongolian women, the Manchu hoped to impose the Chinese lifestyle and culture on Mongolians. This policy increased Mongolians' resistance to Manchu rule, and as the Manchu Dynasty collapsed in China, the Mongolian princes and the public declared their independence from the Manchu's and therefore, from the Chinese (December 16, 1911). * They crowned Javzandamba VIII, the national religious leader, as the Bogd Khan, Head of Church and State, thereby establishing a theocracy with a bicameral parliament. 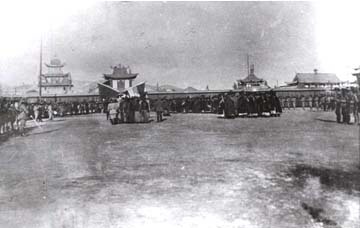 The Chinese force the Bogd Khan to surrender Mongolian autonomy, January 2, 1920, courtesy of the National Museum of Mongolian History. Following this treaty, the old czarist regime suffered its own revolution and Russia became a Communist state. Battles between White (loyalist) and Red (Communist) Russians continued to be fought on Mongolian soil even after Lenin took over the government. Concerned about this new development, the Chinese Republic dispatched General Hsui Shu-cheng to Mongolia in 1919 to route all foreign forces from Mongolia. He dissolved the government of the Bogd Khan in February 1920, making Mongolia a Chinese protectorate. Many Mongolians formed their own liberation organizations. One was the Mongolian Peoples' Party (MPP). With the support of the Bogd Khan and the Mongolian princes, the MPP sent a small delegation to Russia to request aid from the Communist Russians in organizing the liberation army and supplying it with ammunition. Beginning in February 1921, the Mongolian rebels with Communist support began to fight against the Chinese. By the summer, so many Mongolians had joined the rebels that the Chinese were repelled and forced out of Mongolia. Once more, China refused to recognize Mongolia as an independent nation. So Mongolia turned to the new Soviet Union again. On November 5, 1921 a small delegation met with Lenin, head of the Soviet government, and forged a Mongolian-Soviet treaty of mutual recognition and friendship. At this time Lenin commended the Mongolians' national liberation struggle and advised them to develop the country along Communist lines. * Within months of the Bogd Khan's natural death, the MPP called a National Assembly that established the Mongolian People's Republic, a Communist-oriented government. 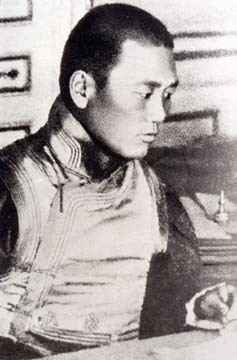 D. Suhbaatar, a young revolutionary and member of the MPP (Mongolian People's Party) who led the Mongolian troops against the Chinese invaders, courtesy of the National Museum of Mongolian History.